Inner City Press asked Saudi Arabia’s ambassador to the UN Abdallah Yahya A. Al-Mouallimi to confirm it was an Saudi strike and explain it. He said, “I am not aware of it.” Vine video here. After Saudi Arabia was re-elected to the UN Human Rights Council on October 28, with the votes of 152 of the 193 member states, the Saudi-led Coalition’s bombing of Yemen picked up pace, including killing detainees in Al Hudaydah. Now a draft has been obtained by the source and is exclusively published below: it does not condemn the airstrikes but demands a cessation of hostilities, and for the envoy to report back in 15 days. On October 31 outside the UN Security Council, envoy Ismail Ould Cheikh Ahmed came out to take questions. But Ban Ki-moon’s deputy spokesman said he would only take two questions because he had to meet Ban — strange, given that Ban’s scheduled only listed him at 4 pm, three hours in the future. Inner City Press asked, quite audibly, if weapons sales to Saudi Arabia by the UK and US is helpful to his mandate. Ban Ki-moon’s deputy spokesman cut in, awarding the question to another. After that, Inner City Press asked again, if US fueling of Saudi warplanes helps the envoy’s mandate. He did not answer. Video here. He walked down the hall where Inner City Press under Ban’s censorship order can’t go without a minder but others can. But where was he headed, with three hours until his listed meeting with Ban? The next day November 1, Ansar Allah’s spokesman mocked Ban’s envoy, full Arabic statement obtained and published by InnerCityPro.com here. 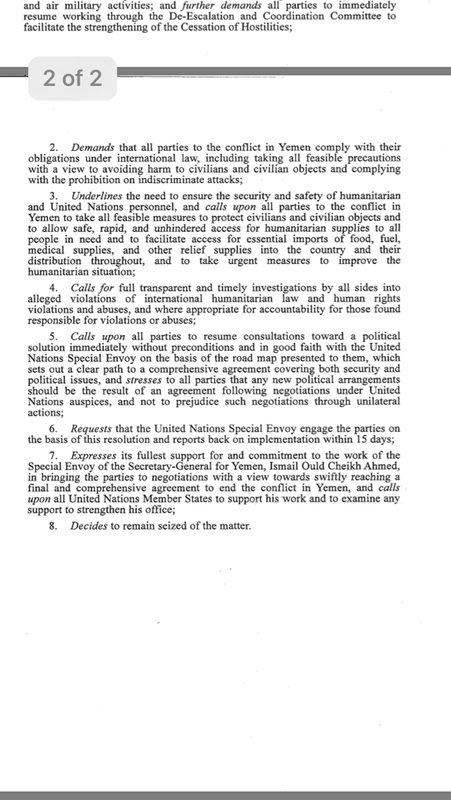 Some: “the UN envoy to Yemen in briefings presented to the Security Council to provide cover for the countries of aggression, as experienced by the Yemeni people from the reality of a painful and unfortunate result of brutal aggression, and contributes one way or another with the help of the executioner against the victim and prolong the war and the adoption of fallacies and fabrications do not hear but channels of disinformation for the countries of aggression…. not realizing that such acts foolish had violated his mission as an envoy of peace, turning to war exercises shipping confessional of the platform is supposed that the UN, which is fueling the conflict and rivalry and stoke the fire of hostilities between the people of the nation. Inner City Press: Should President Hadi cede power to a new vice president. That’s what people are saying is in the Road Map. Is it time for him to put the larger picture ahead of himself? Rycroft: We support the Special Envoy’s Road Map, and you’re right that part of the Road Map is on the political process and a longer term political settlement for Yemen, and the other part of it is the security. And taken together, they provide a balanced package that will allow all of the relevant parties to move forward, including in the longer term a new governing structure and new governing people to take Yemen forward. Inner City Press put the same question to French Ambassador Francois Delattre, who said it would require too long an answer. Video here: including Inner City Press’ “you know where to find us.” Watch this site. InnerCityPro.com obtained and published the National Delegation’s response to Ismail Ould Cheikh Ahmed’s proposed roadmap, here. Spokesman: My understanding is that certain documents were leaked that were shared, so we’re not going to comment on these leaked documents. I think it’s not a surprise that, in any mediation negotiation effort, different plans are put forward, and what we very much hope is that all the parties involved will support and continue to support the work of the Special Envoy. Spokesman: No specific information on where that plan lies. I think the Special Envoy answered that question that in fact, you had asked him, and I don’t see any reason why his opinion has changed in any way. Spokesman: It’s clear that the bombing has resumed. I think the pause, although very short, gave respite to some Yemenis. It allowed us to start some humanitarian… some humanitarian distribution, though some were blocked, notably some continue to be blocked in terms of entering Taiz. The Special Envoy is in… is in Yemen. He, as you saw over the weekend, has asked for… had asked for an extension and asked for a renewed commitment to the pause. And he will continue… he will continue to advocate for that. ICP Question: Does he consider… does the Secretary-General, who removed the Saudi-led coalition from the children and armed conflict annex on Yemen, consider the intentional bombing of agricultural land to also be something relevant to his consideration before he leaves of putting them back on the list? Spokesman: The… if there was intentional bombing of agricultural land, that would fall under the intentional targeting of civilian infrastructure, which is prohibited by international law. Yeah. Yeah – like, what are Ban Ki-moon and his envoy DOING about any of this? While the US took no action on the strike by its ally Saudi Arabia which it support, on October 12 it bragged of Tomahawk missiles at Houthi positions. On October 15 it alluded to a possible radar malfunction while, along with UK Minister Tobias Ellwood, welcoming the Saudis’ own self-investigation. Inner City Press: On the Yemen funeral bombing, does the UK think that the Saudi-led coalition that does the self-investigation is enough or that there should be a more serious investigation? Amb Rycroft: Well, whenever there are allegations, we insist that the Saudis investigate them. The Saudis have been investigating this one and they have committed to doing it fully and thoroughly and quickly and transparently. And that is going on and we welcome that. And we will look at the results of that and if anything further is required then we will make up our minds. Inner City Press: I’d asked you this in writing but maybe you’ll have a statement. The US has announced that it fired Tomahawk missiles at Yemen, they say at radar-controlled and Houthi-controlled territory, which they say targeted their boat. The Houthis deny it, say it may have been Saudi Arabia. Has the US communicated anything to the UN about this use of force on Yemen? And does the… does the Secretary-General have any concern about the escalation? Spokesman: No, I’m not aware of any official communication. The Special Envoy for Yemen urges all the parties to exercise maximum restraint in order to bring the violence down, and he will continue to focus his efforts on securing a recommitment to the Cessation of Hostilities. On October 12 in the UN’s Third Committee, the US speech on Children and Armed Conflict didn’t mention Ban’s dropping of Saudi from the list. The UN’s Cristina Gallach’s DPI didn’t put the video online, eight hours later. On October 10 UN Secretary General Ban Ki-moon held a two-question stakeout and spoke about the airstrike — he did not, however, say that he was putting Saudi Arabia and the Coalition back on the Children and Armed Conflict annex he took them off of. Inner City Press asked audibly, Are you putting them back on the list? Vine here. Ban did not answer. Inner City Press: there are controversy in a number of countries, but the UK and the US are two of them, about continued arm sales to Saudi Arabia. And I wonder, given the things that the Secretary-General said at the stakeout yesterday, does he believe that countries should review under the new arms… you know… control treaty, arms sales to Saudi Arabia at this time? Spokesman: I think, you know, the Secretary-General, I think, a few months ago had already spoken to this when he was in London. First of all, all those countries that sell weapons have a responsibility that those weapons are used in a way that does not violate international human rights law, international humanitarian law, as a broader point, that those States who are parties to the arms trade treaty need to set an example in fulfilling one of the treaty’s main purposes, which is controlling the arm flows to actors that may use them in a way that breach international humanitarian law. Spokesman: I think there’s no… I think the Secretary-General could not have been clearer that there’s absolutely no excuse for what happened yesterday. At the October 10 UN noon briefing, Inner City Press asked Ban’s spokesman Stephane Dujarric what it would take. Beyond the Vine video here. It remains unclear. Ban’s envoy Ismail Ould Cheikh Ahmed is delaying his briefing of the Security Council from October 20 to the 31st — some urgency — and when Inner City Press asked about the Interior Minister’s critique of the envoy, Dujarric insisted the envoy has no control. Was he told, did he convey the message, at least as a bridge? If not, should he be replaced? The EU’s Yemen representative has already moved on. We’ll have more on this. “Secretary Kerry spoke on October 9 to both His Royal Highness Deputy Crown Prince Mohammad Bin Salman and Foreign Minister Adel al Jubeir regarding the situation in Yemen. Secretary Kerry reiterated our deep concern about the October 8 attack on the funeral hall in Yemen that resulted in a large number of civilian casualties. He welcomed the Deputy Crown Prince’s commitment to launch a thorough and immediate investigation of the strike and urged him to take urgent steps to ensure such an incident does not happen again. The Secretary also reiterated the need for an immediate cessation of hostilities, and the Deputy Crown Prince stated his desire to institute a renewable 72-hour cessation as soon as possible, provided the Houthis will agree. No word of any UN Security Council action. ‘I am deeply concerned by reports of an airstrike hitting a funeral hall in the Yemeni capital Sana’a yesterday. The scenes from the site are shocking. I am raising my concerns with the Saudi Ambassador to London today and urge the Saudi-led coalition’s announced investigation into the incident to take place as a matter of urgency. So – no UN Security Council reaction? We’ll await more, particularly from the UK as penholder. UN Secretary General Ban Ki-moon, who removed the Saudi coalition from the UN Children and Armed Conflict annex on Yemen, offered what he called his “sincere” condolences. France, whose foreign minister Jean Marc Ayrault declined to answer Inner City Press’ question on October 8 about the Saudi bombing, now says it is “shocked” – without mentioning Saudi Arabia. The Security Council, in which the UK “holds the pen” on Yemen, has yet to say anything. Now Interior Minister Jalal Rwichan has issued a statement, forwarded to Inner City Press, stating that Ban Ki-moon’s envoy Ismail Ould Cheikh Ahmed was told of a cessation in hostilities for the funeral, that on that basis people went – and were killed. He says not to trust the UN or its envoy anymore. This has been a trend under Ban Ki-moon, in Sri Lanka and elsewhere. We’ll have more on this. After the French resolution failed in the Security Council, its foreign minister Jean Marc Ayrault came to the stakeout. Inner City Press asked him, loudly, if he thinks the Saudi bombardment of Yemen should also be taken up by the Security Council, after an airstrike on a funeral most recently. He did not answer, despite the question being repeated. Vine here. He left. While Ambassador Matthew Rycroft of the UK, which holds the Council’s “pen” on Yemen, also did not answer, Vine here, New Zealand’s ambassador when Inner City Press asked if his country also thinks the Saudi-led coalition should stop bombing Yemen said, “I do.” Vine here. But by the end of the meting, following a walk-out by the UK, US and others, the UK as “penholder” on Yemen in the Security Council had not, according to the president, circulated any draft Press Statement. Watch this site. UN Secretary General Ban Ki-moon has let the Saudi led coalition off the Children and Armed Conflict annex on Yemen, while Saudi Arabia runs for a Human Rights Council seat. How much lower can the UN get? After a UAE warship was hit – and sunk – off the Yemeni coast near Mocha, Inner City Press on October 3 asked Ban Ki-moon’s deputy spokesman Farhan Haq for a comment, and if the UN knows if it was a warship or as claimed an aid ship. See October 6 US travel warning, below. On October 4 Haq returned with, “it doesn’t sound as if it was on a humanitarian mission.” Vine video here. So on October 5, Inner City Press asked UN spokesman Haq again, if what he said about the UAE ship not being on a humanitarian mission still stands. He said, “Yes,” and “that was the information I had.” Vine video here. But the UN Secretariat has not given any update, much less correction. So what precedent does this Security Council Press Statement create? Inner City Press: Given that the Secretary-General, whether you called it removed or temporarily removed or suspended Saudi Arabia from that Children in Armed Conflicts List what… what message does it send? Obviously, one of the things that people… that Member States might weigh is whether a candidate for the Human Rights Council is on one of the annexes of Children in Armed Conflict or sexual violence or any of the other, sort of, lists of shame. So how should they read this removal? Are they going to be put back on during this campaign season? Are they remaining off during it? And doesn’t he then acknowledge that he’s had some impact on the way in which they will be evaluated for this position? Deputy Spokesman: I think if you look at the website, it makes clear that Saudi Arabia is currently temporarily suspended while a review is ongoing. ICP Question: Which is a different status than people that are on the list. Deputy Spokesman: It’s also a different status from people who are not on the list entirely. Inner City Press: on Yemen, I wanted to know if the UN system has any comment or knowledge of this reported sinking of a UAE (United Arab Emirates) warship. Some are saying it was an aid convoy. The Houthis’ side is saying it was a warship enforcing a blockade on them. Since it’s a pretty high-profile incident that has the potential to result in reprisals, what’s the UN’s understanding of what the ship was? Was it an aid ship, or was it part of the military operations of the Saudi-led coalition? Deputy Spokesman: Well, we’re aware of the latest reports, but we’ll need to get some further information about the nature of this vessel before we make any particular comment. Question: Given the UN’s role in the humanitarian operation in Yemen, do countries like the UAE coordinate with UN if they’re, as they say, moving medical supplies from one place to another, or is it just, everyone goes it alone? Inner City Press: Q: On Yemen, what’s the process for the UK to review its sale of weapons to the Saudi-led coalition? That seems to be an issue. What would it take to stop that flow? Amb Rycroft: The UK has a very clear set of arms control policies in place, and they are of a very high standard indeed, and we use those to make sure that we are satisfied with any arm sales to anywhere around the world, including in relation to Yemen. Inner City Press: But the airstrikes on MSF (Medecins Sans Frontieres), did that trigger some sort of second review? Amb Rycroft: Well, we continue to look at all of our policies in relation to Yemen. We provide political support to the Saudi-led coalition, we are not members of the coalition, and whenever there is any one of these incidents, or allegations of incidents, then we are the first to call on the Saudis themselves to be following up and investigating. Amb Rycroft: on Yemen I just wanted to reassure you that the UK did not block a text from the Human Rights Council in Geneva last week calling for an investigation. In fact, the UK worked very hard to get as strong a text as possible, and we got consensus. And we’re very glad that it was agreed by consensus. The UN Secretariat of Ban Ki-moon’s bungling of Yemen mediation has become ever more clear, according to multiple sources and documents exclusively seen by Inner City Press, see below. And see this Vine, & this. Churkin noted Russia abstained on the last resolution – and said that the UK blocked an investigation because they sold $6 billion in weapons, the US is involved too. On October 4 Inner City Press asked Churkin again about Yemen and he said the draft statement was in the works. And now? While awaiting more, we note that Bernardino Leon while working ostensibly for the UN on Libya negotiated a job with a UAE diplomatic institute. That was just another piece of UN for sale under Ban Ki-moon. But now it may be time for Bernardino Leon to work for that money. Watch this site. On September 23, Inner City Press went up to document Ban Ki-moon’s meeting with Abdu Rabbu Mansour Hadi. The latter walked slowly in to the room for the ceremonial handshake and book signing. Ban Ki-moon appeared to position Hadi (more than one reader called Hadi puppet). Hadi in turn in term spread out his hands. Photos here and here. Beyond the Vine video here. Amid airstrikes on Yemen, Saudi Arabia this week at the UN has sponsored a garish multimedia display, workshops and culminating event with Ban Ki-moon, the Secretary General who let the Saudi-led Coalition off the Children and Armed Conflict annex. In the UN’s 1B basement by the Vienna Cafe, a long TV screen has shown footage of palm trees and journalists, holograms testifying to a hallway draped in a large carpet. Inner City Press arrived at 4 pm for what was to be Ban Ki-moon’s get-down, or most recent get-down, with the Saudis. Ban Ki-moon arrived at 4:30 pm and was led by the arm around the exhibit, Inner City Press Vine video here. He was taken to a table and put on virtual reality goggles, presumably without cluster bombs or Yemeni children shown. Periscope video here. Interviews were conducted; Inner City Press rushed up to the UN’s fourth floor, but the full-floor event was being taken down. Ban’s next appearance would be that evening, for South Korea where he hopes to be President. Watch this site. Now it seems Ban Ki-moon’s UN is equally out of it, perhaps more intentionally so. Inner City Press asked Ban’s spokesman Stephane Dujarric on September 30 of the much weakened UN Human Rights Council resolution which rather than setting up a panel merely attaches some UN to Yemen’s whitewash. I haven’t seen the details, Dujarric said. Vine here. He added that Ban’s envoy Ismael Ould Cheikh Ahmed is headed to… Saudi Arabia. We’ll have more on this. On September 23 it was quickly over but to way to the elevator down, Inner City Press ran into and greeted UN envoy Ismael Ould Cheikh Ahmed on his way to the meeting and two representatives of Human Rights Watch, on the UN’s 27th floor. What were they doing there? Both were formerly journalists covering or channeling Ban Ki-moon, now with insider access. Does it make Ban Ki-moon feel better, to have them around while he sells out Yemen’s children? Inner City Press: Given that the Secretary-General himself decided to remove the Saudi-led Coalition from the Children and Armed Conflict regarding Yemen, given that this airstrike has killed children and women, what’s the status of putting them back on? Spokesman: Well, they were… as I said, they were not removed. It was a temporary suspension, as you can look on the document. I think we are constantly looking at and reviewing the situation in Yemen, and when we have something to share with you, we will. We’re waiting. It seems clear Ban gave Hadi a copy of his vanity press book. Birds of a feather. On September 22, Inner City Press asked the European Union’s Federica Mogherini if the EU has any role in Yemen. She said she had just met Hadi. And? “We note with deep concern the sharp increase in civilian casualties since the suspension of peace talks, with 180 people killed and 268 injured in August. This represents a 40 per cent increase compared to the civilian casualties the previous month, with 60 killed and 123 injured. There has been an increased number of attacks against protected civilian objects, with at least 41 incidents affecting educational and health facilities, markets, places of worship, airports and civilian homes in August. The most recent incident took place two days ago, on Wednesday, 21 September, when an airstrike hit a residential area in the town of Hudaydah, killing 26 civilians, including seven children, and injuring 24 others, among them two children. The death toll could be much higher, as our team continues to collect information. We are particularly concerned at the situation in the city of Taizz, where a blockade imposed by the Houthis-affiliated Popular Committees has caused serious food, water and fuel shortages, and a near collapse of the health system. In the light of the high civilian casualty numbers and the terrible suffering of the civilian population, we urge all parties to respect their obligations under international humanitarian law, including their obligation to respect the principles of distinction, proportionality and precaution. We reiterate our call for the setting up of an international and independent investigative body. Inner City Press asked Ban’s spokesman Stephane Dujarric at noon on Septmeber 22 about Yemen. He called the question “granular” and his office later said, too little too late, “The Secretary-General condemns the multiple airstrikes by the Saudi Arabia-led coalition on 21 September in the Red Sea port city of Hudaydah, Yemen, which killed and injured dozens of people, including children and women. The Secretary-General expresses his sincere condolences and sympathies to the families of the victims and wishes a speedy recovery to those injured. The Secretary-General once again reminds all parties to the conflict that they must fully respect their obligations under international humanitarian law, in particular the fundamental rules of distinction, proportionality and precaution. He reiterates his call for urgent measures to protect civilians and civilian infrastructure. The Secretary General’s Special Envoy for Yemen, Ismail Ould Cheikh Ahmed, is extremely concerned by the recent inability of the Central Bank to pay salaries due to lack of revenue and shortage of liquidity. Millions of Yemenis families depend on civil service salaries and the stoppage in salary payments is expected to have a severely negative impact. What about the firing, and proposed moving? What about the reported threat to UN plane? And see below. On August 18, Inner City Press exclusively published the proposal that Ban’s envoy Ismail Ould Cheikh Ahmed made in Kuwait. This was the proposal described as blatantly one-sided that led to a collapse of the talks, the Saudi-led Coalition increased airstrikes and the death of more civilians. According to local media the Saudis threatened to shoot down UN aircraft – click here. Direct sources have told Inner City Press the UN envoy wanted the Sanaa delegation to sign a waiver, and to stop over in Saudi Arabia and be searched. Would the UN go public if this were true? No, under Ban Ki-moon. His spokesman Stephane Dujarric has refused to confirm or deny or comment for two days now. Meanwhile early on September 21 there was a meeting on the humanitarian situation in Yemen held in UN basement Conference Room 12, sponsored by the UK. In order to stake it out, Inner City Press was required by Ban Ki-moon’s eviction order to seek a minder, which are first was withheld. By the time Inner City Press was escorted, all participants were inside the closed meeting. Inner City Press observed Grandi of UNHCR leave the meeting at 8:30, and WFP Cousins walk right by minutes later. What is the UN doing in Yemen, after Ban Ki-moon sold it out? We’ll have more on this.